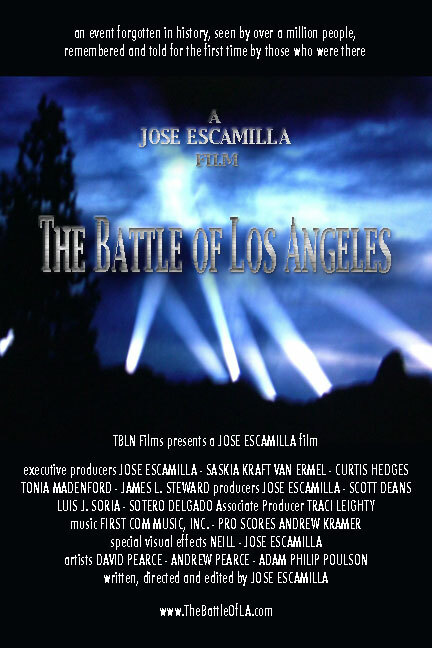 The Battle of Los Angeles is a documentary film by Jose Escamilla about what he calls, the single most heavily documented UFO Case in the history of UFOs. On February 25, 1942, only eleven weeks after the unforgettable attack on Pearl Harbor, an unidentified aircraft appeared in the sky above Culver City, California. Just before 2:30 a.m., military personnel launched an assault on the hovering object, firing more than 14,000 rounds of anti-aircraft artillery into the air. The onslaught was witnessed by more than one million people. After more than 90 minutes of battle, the unscathed craft simply disappeared over the Pacific Ocean. It was never seen again, and this event was destined to become forgotten history… until now. Join the remaining eyewitnesses as they recount their experiences, complete with dramatic recreations, photographs, and documentation of that mystifying night. Witness a new form of documentary film making, from the mind of Jose Escamilla. You deserve to know the truth. Jose Escamilla's documentary film is to be released soon around the same time as two other Hollywood films with similar titles also about "The Battle of Los Angeles", however with a false, misleading message of an alien invasion. On March 11, 2011, and March 15, 2011, "Battle: Los Angeles", a 100 million dollar film, and Battle of Los Angeles, which is being called a “mockbuster” film were released. Hollywood Films still foolishly continue with their dis-info campaign making the ET presence look like an alien invasion despite the fact that these advanced civilizations have never gone on the offensive even if they could after being fired at and chased by air force jets. The Cover Up is over ... It's time to wake up !